On September 18th I initiated a position in US Bancorp (USB). I purchased 20 shares at a price of $54.22 per share. The total cost basis, including commissions, came to $1,089.35 or $54.47 per share. US Bancorp is a Dividend Challenger with 7 consecutive years of dividend increases. US Bancorp had announced a 23.3% increase in their quarterly payout earlier that morning. Based on the new payout the YOC for my position is 2.72% and I can expect to receive $29.60 in dividends over the next year. Due to this purchase my FI Portfolio's forward 12-month dividends are $6,537.81. US Bancorp is a financial institution that operates in 5 segments: Corporate/Commercial Banking, Consumer/Business Banking, Wealth Management, Payment Services and Treasury/Corporate Support. As a dividend growth investor any potential investment must prove to me that they have the willingness and ability to "show me the money". I judge that based on a company's history of both paying and growing dividends to shareholders. As I mentioned earlier, US Bancorp has increased dividend payments for 7 consecutive years. 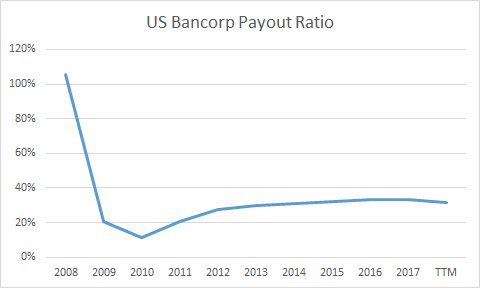 US Bancorp's payout ratio has been quite steady over the last 10 years. The 100%+ payout ratio in 2008 should come as no surprise due to the massive earnings drop related to the global financial crisis. 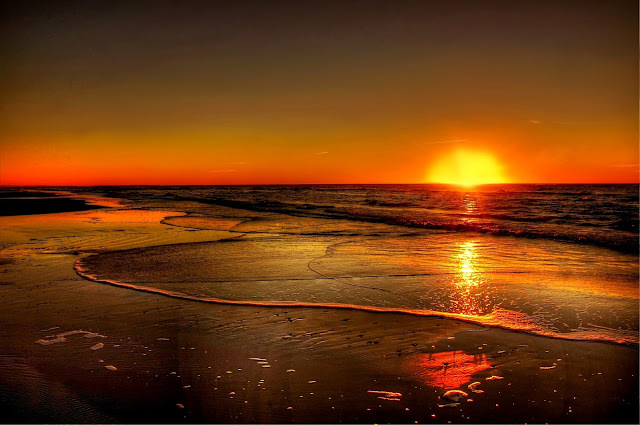 However, since then the payout ratio has generally been between 30-33%. 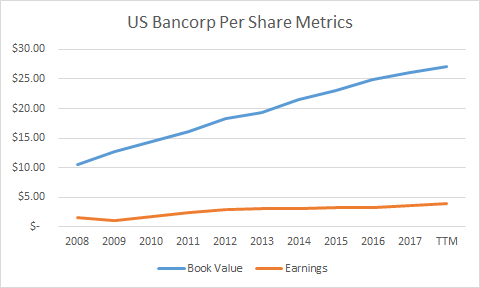 As you can see in the graph below US Bancorp has done a solid job growing both earnings and book value since 2008. From 2008 through 2017 book value grew 149.9% while earnings grew 118.0%. That's good for annualized growth of 10.7% and 9.0%, respectively. Looking at the most recent 5 years book value has grown 42.9% while earnings have grown 23.6% which equate to 7.4% and 4.3% annualized growth respectively. 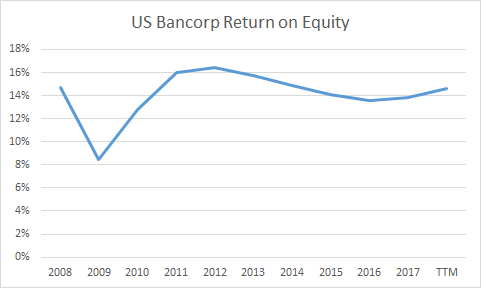 US Bancorp has also consistently maintained a return on equity around 15% which is a very good level. Typically 10% is considered a highly profitable business and US Bancorp is 50% above that. As you can see in the following chart from the St. Louis Fed, the average return on equity for all banks in the United States has been slightly below 10% since around 2012. US Bancorp is doing better than that with ~15% return on equity over that same period. The valuation, using the average analyst's estimate for EPS, looks pretty solid. The estimate for FY 2018 is for US Bancorp to report $4.07 per share in earnings and $4.36 per share for FY 2019. The average 5 year growth rate is forecast to be 6.8%. That puts my purchase price of $54.22 at 13.3x 2018's estimate and 12.4x 2019's estimate. Based on the TTM book value my purchase was a bit on the high side of where I'd like to have bought shares, but I think it's reasonable at 2.0x. Using $1.48 as the starting dividend, my cost basis of $54.22 and a 10% required annual return, US Bancorp needs to average at least 7.1% annual dividend growth in order to support my purchase. That looks achievable considering the estimate is for 6.8% annual growth of earnings. Assuming 5-7% annual growth with a starting yield of 2.7% puts the expected returns in the 7-10% range over the long term. I have some big name investors on my side with US Bancorp being a high quality company. Both Warren Buffet, $5.04 B, and Charlie Munger, $7.00 M, own shares in the bank. In fact both of them added to their positions in Q2 right around $50 per share. What do you think of my purchase of US Bancorp?